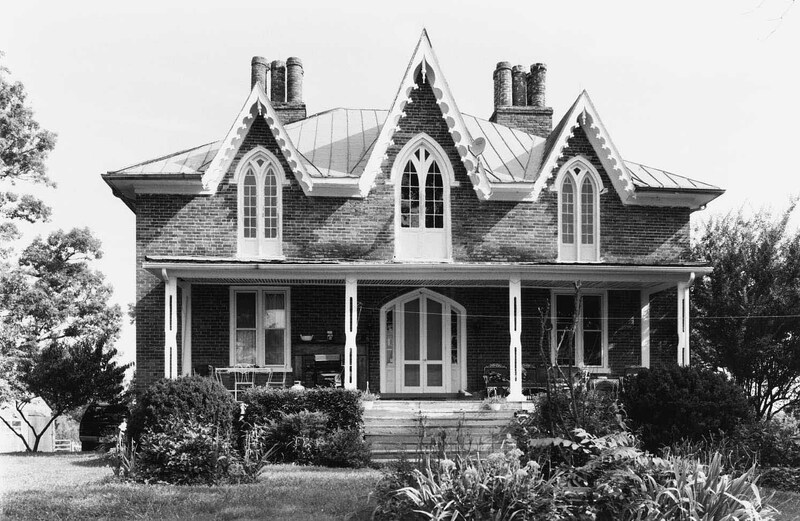 Buckingham Houses: Perry Hill | slate river ramblings . . . .
Perry Hill was built by Col. Thomas Moseley Bondurant (1797-1862) for his daughter, Angelina, who married Dr. William Paxton Hall, c. 1851. Col. Bondurant was a wealthy and prominent Buckingham County politician, member of the board of trustees of Hampden-Sydney College, and a founder of the Richmond Whig. Constructed of brick, Perry Hill is distinguished by a Gothic facade that consists of a pointed-arch entry and windows and pointed gables embellished by fancy verge boards. The design may have been determined by Dr. Hall, a physician whose position in the community demanded a residence in a fashionable architectural style. While spacious, the house does retain a conventional center-hall plan with fairly restrained woodwork. In 1863 the property appears in the county land tax book in trust to William P. Hall, “812 acres Perry Hill”, “From estate of T.M. Bondurant,” apparently who died the year before. At Hall’s death, ca. 1900, his son Alexander Stuart Hall inherited the house and part of the Perry Hill tract. Buckingham County tax records locate Perry Hill at five miles northwest of Buckingham Courthouse. Could Perry Hill be the solution to Buckingham Mystery: Farm For Sale? If it is, in 1868, the property did not sell and stayed in the Hall family. Special thanks to Slate River Ramblings reader Hal Coleman for investigating Perry Hill. Anyone remember any of the caretakers of this property in the late 70s early 80s? A Tim Hutson that lived with his wife and adopted daughter or a man with the last name of Hall that was a truck driver? Joanne- Nice write up—Thank you! Ellen and I would greatly appreciate your posting a correction as soon as possible, however. Perry Hill is NOT for sale. We are pleased to have owned and loved PH since purchasing it in 2009 and have no plans to EVER sell. Buckingham Notables: Dr. William P. Hall | slate river ramblings . . . .
Buckingham Notables: Judge A.S. Hall (1852-1932) | slate river ramblings . . . .